As I was performing a scavenger hunt for the origin of the popular phrase “Oh the Humanity” in audio form, I came across this very interesting digital archive website with a plethora of photos, recordings and other interesting things about historical moments in American history. Just by reading the Introduction page, you understand exactly what the site is attempting to do. Eyewitness is connecting with a wider audience than would ever have the opportunity to go digging around in the archive. The site provides personal accounts of pertinent historical events in American history, specifically those that would be most popular. 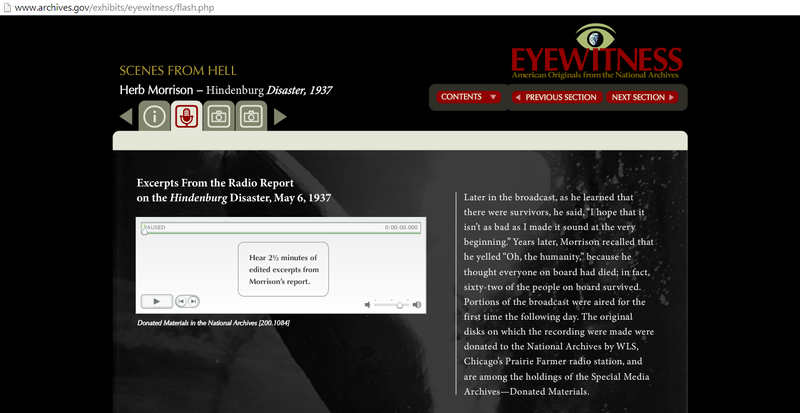 After you find the Hindenburg Disaster Broadcast, be sure to poke around under the other headings to see what else you can find! Click the tab displaying Contents. Click Scenes from Hell. Click Herb Morrison- 1937 Hindenburg Disaster. Click 2nd tab displaying the picture of the microphone. Click play on the audio player.